In reviewing four museum tablet apps, I hoped to come to some better understanding of how they might used for museum education. We’d already developed an iPad app at the Museum of Science that was used by tour operators for our Segway tours, and their value as docent tools has been covered by others. But as visitor tools, what can these apps tell us? Tablets are personal devices and as Robin pointed out, intimate. The four apps I reviewed come close to capturing some of the mystery of that experience of the authentic, what my old boss Larry Bell called the “wombat effect”. 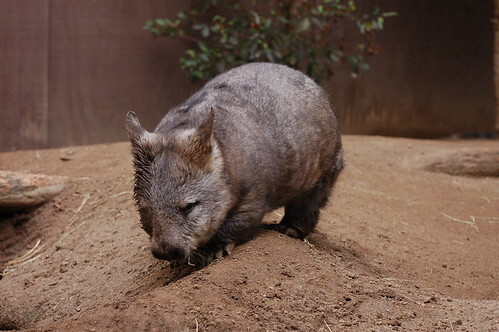 As an educated North American person, he knew what wombats were, he’d read about them, seen images of them in books and on TV and could tell you something about them. But he’d never “seen” one. The first time he came face to face with a wombat specimen in a museum, he had that “Aha!” moment, when being confronted with the object and all the sensory impressions you get from it (how it looks, it’s size, your proximity to it, who you’re with in the space, etc…) totally changed his understanding. AbExNY, and Road, Inc. I think came closest to expressing the potential for apps to express that “aura” that Kevin Slavin referred to in his MCN 2011 keynote on “the 21st Century Aura”. Both apps surrounded the objects they featured with a rich cloud of information that extended and deepened my experience of studying the depictions of the objects visually. I think it’s also a differentiating factor that they opt to do this as a subordinate activity, rather than curating an experience that merges viewing the objects with metacontent the way New York Public Library’s “Biblion” does. Tablets have more potential to be social. My sense is that people treat a tablet more like a small desktop than a large mobile. They’re portable as opposed to truly mobile. So in answer to Gretchen’s comment in my last post about what it would be like to carry one around in a crowded gallery, I’d reckon that it’d be pretty tiring after an hour or so. You can’t stuff it in your pocket and none of them come with carry handles. If I could go back in time and see “Infinite Variety” or “AbExNY” , I’d probably use my phone, rather than my tablet. In my own use, and I say this knowing full well the perils of n=1 samples, I tend to carry my tablet around to safe places and then take it out and use it when I’m settled somewhere like the couch, bed, in a waiting area, or coffee shop. As I wrote before, if the killer app for mobiles is killing time while you’re waiting for the bus, then the killer app for tablets I think is lingering over things you’re interested in. Tablet usage studies show that use peaks late in the day, and coincides with people being at home after work and sitting on their couch or laying in bed, reading. This fits with the Pew Center’s findings on why Americans download tablet apps. After news (74%) and communication apps (67%), the two most common kinds of apps people put on their tablets are ones that help them learn about things they’re interested in (64%), and help them get more information about a subject (55%). More people look for ways to satisfy their curiosity on their tablet than watch movies on them (43%). That’s an opportunity for 2012. Hey Ed – this is interesting. Your last paragraph relates to something I’m going to post in a couple of days about curiosity in the Information age, and is good food for thought. I might have to ponder how it does/could fit into some of my ideas at the moment. For an Antipodean like yourself, you might want to substitute “moose” or “possum” for “wombat” so you get the right exotic vibe. I think the intimacy/social trade-off is an interesting issue here. Our university art museum had an exhibit recently for which they rented iPads that had an app providing an audio tour and more information about the paintings. The rental included headphones for the audio guide, but as I walked around the exhibit I was struck that the vast majority of people were not listening to the audio guide because they wanted to be able to talk to the other people they were with.